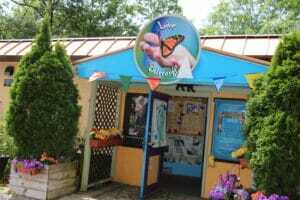 Bear Mountain Butterfly Sanctuary, located in the Poconos, is a great indoor destination for small children. 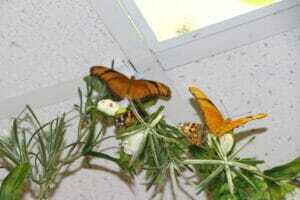 Although the activities are geared for the young ones, the butterfly atrium can be enjoyed by all. 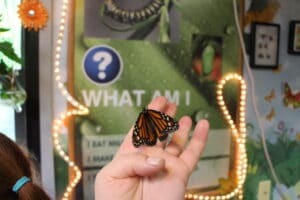 When we were there, there were seniors who came on their own to enjoy the experience of being in close proximity with butterflies. In the Bear Mountain Sanctuary, almost every visitor is able to hold a butterfly (usually on a stick) or have one on you, more so than in other Butterfly places I’ve visited. 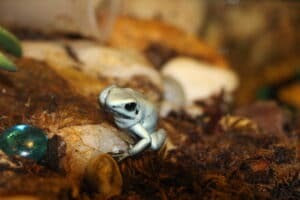 The Bear Mountain Sanctuary also includes an exhibit of poisonous frogs. The small frogs in glass cages have unique colors such as orange and blue. There are interactive butterfly-themed activities in the sanctuary, such as butterfly shaped puzzles, butterfly coloring stencils and more. The sanctuary walls are decorated with a butterfly motif and going inside feels like entering an oasis of wonderful winged creatures. Monday-Thursday $1 discount for AAA members and everyone in their party.